How many times has this happened to you on your Nokia phone? You take out your MicroSDHC card and toss all your MP3s on to it… put it into the phone, Music Player begins to refresh and… Freezes. Well, the bar is still moving but your refresh counter is either stuck at zero or some other number that is much less than the actual amount of music you added. This was a permanent error and required you to delete your media database to allow it to reload any new media ever again. This upset me greatly and it seems like no one online had a clue to it’s cause or how to fix it; So, I set out to do what Nokia should have done ages ago and debugged/solved it myself! There is a bug within a hidden system service called MPXHarvesterServer. Its mission is to update the media database if any new or changed media show up on the phone. My current theory is this: If the harvester hits an MP3 file with either desynchronized ID3v1 and v2 tags, general ID3 corruption or “non-standard” tags hacks on an otherwise playable track it just suicides and corrupts the media database. It could also be that the MPX harvester server just doesn’t like anything but ID3v2.3 and chokes/dies on 1.1/2.2/2.4 tags. Use software such as MediaMonkey (FREE!) to repair/resyncronize ID3 tags on your PC before synchronizing or copying to phone. The ghetto method of doing this is to select your whole music library and then edit one of the normally unused ID3v2 tags, such as ISRC or custom elements so it forces a complete redo of the ID3 tags on the files. 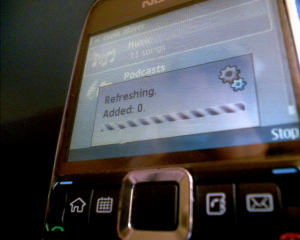 If you happen to work for Nokia/Symbian: Please add at least a bit of error resistance/fallback. While your there make it so the music player only scans for music in the */music/ folders and not my ringtones or recorded messages directories, thanks.